Learning to play the bugle. How do I start? Where do I get a bugle? Every week I receive an email from someone who is interested in learning to play the bugle. Their desire is to play for military funerals when a live bugler can’t be found. With the decrease of support from active duty services to provide live musicians for military honors and the amount of funerals every day, many players are stepping in to fill the need. This is a wonderful and honorable thing to do. Many of these buglers are those who have not played in many years and some are starting from the very beginning. 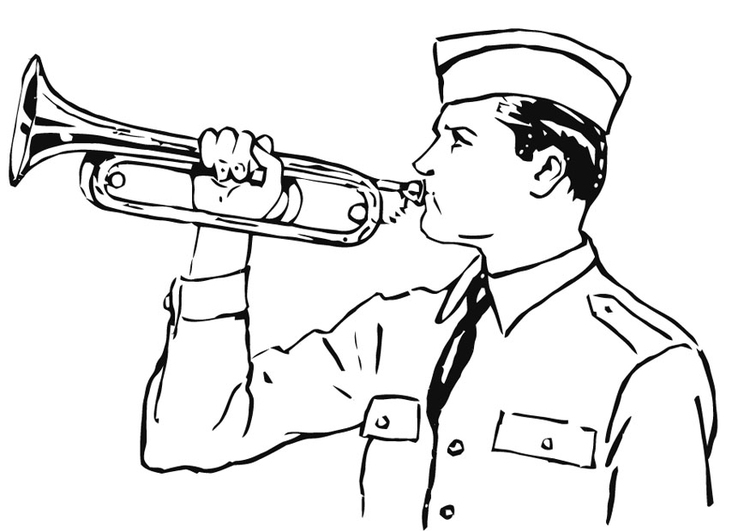 It is important to note that performing Taps on a bugle (or trumpet) is something that cannot be learned overnight. It takes a strong desire, practice, patience, and a good instrument on which to learn. The best thing to do is to get a trumpet or cornet and take some lessons from a professional trumpeter. If you have played trumpet in the past you should have some of the basics down already and it shouldn’t take too long in getting your embouchure back into playing condition. If you are a beginner, find a good instrument and a good mouthpiece to start on and remember that it takes a little while to get a decent tone so be patient. A good teacher will guide you along. There are good trumpet methods available that your teacher will recommend. Contact the music departments of local university and colleges. There are always some students who are willing to teach, especially those who are going into the music education field. You can ask the band director at the local high school for any references. Also check with the local musicians union or association. The Buglers Handbook by Nelson Node Available from Mel Bay Publications, #4 Industrial Drive, Pacific, MO 63069-0066. The US Army Band (“Pershing’s Own”) has, for over fifty years, used a B flat bugle (signal trumpet) Bach Stradivarius model made by the Vincent Bach and later Selmer Corporation. These bugles are based on the M1892 model but pitched in the key of B flat and made to higher specifications than commercially available bugles. The original Bach bugles were gold plated and the second batch manufactured were lacquered. Two original ones are on display; one at the Army Band Building at Fort Myer, the second in the Visitor Center at Arlington National Cemetery. The latter is, of course, the famous “Kennedy Bugle.” All the bugles have been used to sound Taps at the Tomb of the Unknowns at Arlington as well as the many simple honor funerals at the cemetery. For years Selmer had refused many official and private requests to manufacture any additional bugles past the original twenty or so they made for the band in the 1960s. In 2007, Bach produced about two dozen gold plated bugles to update the US Army Band’s inventory. A few of them made their way into private hands. The Getzen American Heritage Field Trumpet (named by Jari Villanueva) is pitched in B flat, made of the finest brass, with a medium large bore. The bugle has a tuning slide, water key and two tabard rings. The American Heritage is a free blowing horn without any of the resistance found in the valve tubing found on regular trumpets. The intonation is superb throughout. It is a double twist horn measuring 16 inches from bell to shank with a 5 inch diameter bell. The bore size is .459. The American Heritage Field Trumpet also has an extra slide to lower the pitch into G. This addition came after many players expressed the desire to have a G horn instead of B Flat. Kanstul entered the bugle market and has produced a superb bugle for use at funerals and ceremonies. It is a double twist horn measuring 16 inches from bell to shank with a 5 inch diameter bell. The bore size is .460 and the intonation is excellent.. They produce horns in B Flat and G. The price for Kanstuls are less thn the Getzens and are used by many organizations including the Maryland National Guard Honor Guard. The Getzen and/or Kanstul instruments are bugles that would be appropriate to sound Taps at a funeral or to bugle at a ceremony. I know that there are many trumpeters in police and fire honor guards throughout the country who are looking for a good B flat bugle to use rather than a valved trumpet. The regulation G (Boy Scout) bugle and the â€œGunga Dinâ€ British Duty reproduction bugles just do not cut it for intonation and beauty of sound. There is no question about it. Get a good mouthpiece! Personally I’d rather see a good modern mouthpiece on a bugle than a cheap one that came with the bugle. Nothing feels more comfortable than your own and it will help produce a good sound. I recommend a modern Bach or Schilke mouthpiece. This entry was posted on Tuesday, November 15th, 2016 at 10:00 am	and is filed under Bugles for Performing and Collecting, General Interest, Getting Started on the Bugle, History of Taps, History of the Bugle, News, Taps in Recent History. You can follow any responses to this entry through the RSS 2.0 feed. Responses are currently closed, but you can trackback from your own site.